For four years, Belgian soldiers are on guard on the Yser. In their writings, certain animal metaphors are more frequent than others. Without a doubt, the word "dog" gets the lion's share. For a civilian in uniform, being a soldier is a "dog's job". On the front, the combatant frequently endures "weather fit for dogs", which eventually makes him "sick as a dog". And when not referring to the Germans as "Huns", he called them "dogs"! These expressions express an ancient heritage, from a time when many errant, mangy, scruffy and half wild dogs lived on the margins of human communities, and were periodically hunted down for health reasons. 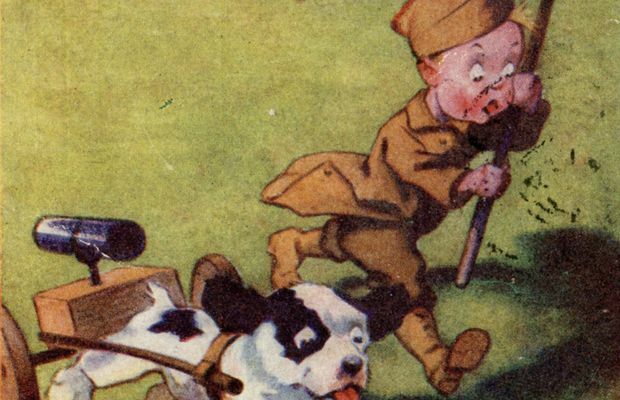 By 1914, however, dogs are already considered to be man's best friend. A passion for dog breeding develops in the second half of the 19th century, with attempts to create "races" of dogs particularly suited as hunting, guard or racing dogs, or simply in order to keep their masters company. Dogs become numerous in European cities and villages, even though most people can't afford such an expensive pet. Present everywhere alongside men, dogs will live through the first worldwide conflict at their side. For better and, often, for worse, they will never be far from the war experience. 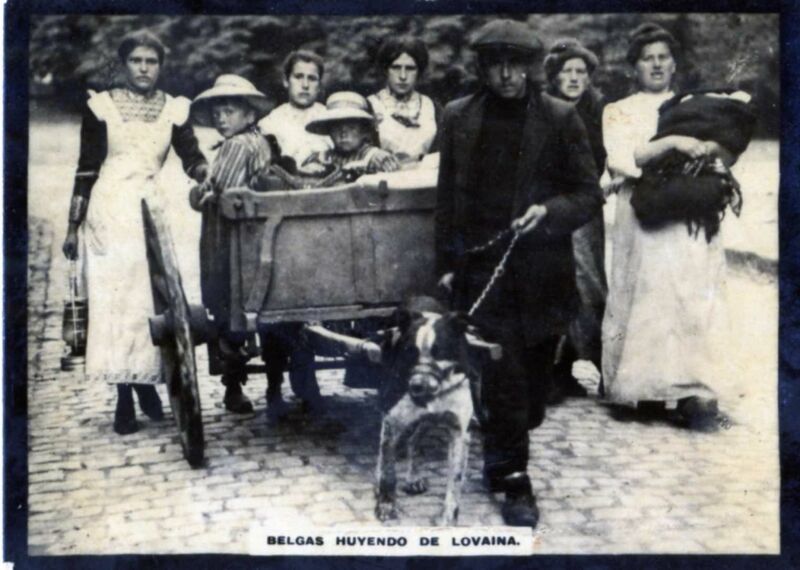 Today's Belgians seldom remember, but at the start of the century, draught dogs were one of the main images that foreigners had of Belgium and the Netherlands In fact, many retailers and peddlers had their merchandise pulled around in a cart drawn by a dog. For their part, knife grinders sometimes sharpened the blades of the knives of their customers thanks to a dog: running in a cylindrical metal cage, the dog turned the grindstone. 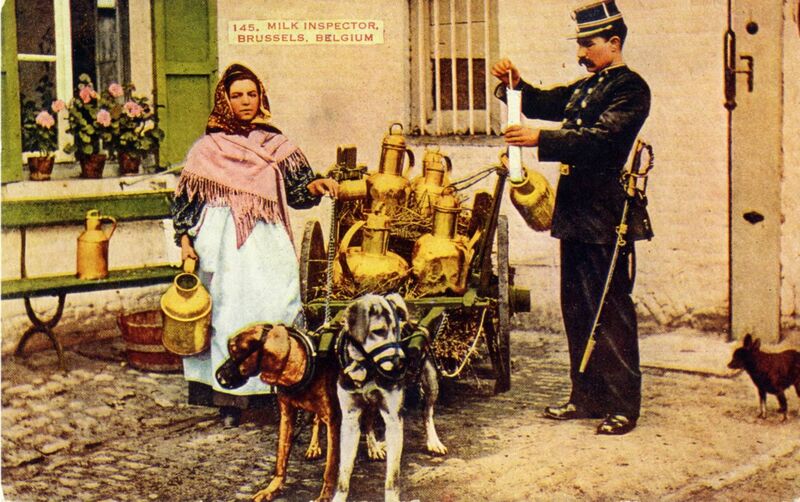 Many French, German and British postcards, focusing on the "exotic" nature of Belgium, illustrate vehicles drawn by dogs (generally milk carts, with or without an inspection of the quality of the goods by the police), with the characters being shown in traditional clothing, against the backdrop of windmills or other buildings or "typical" accessories. 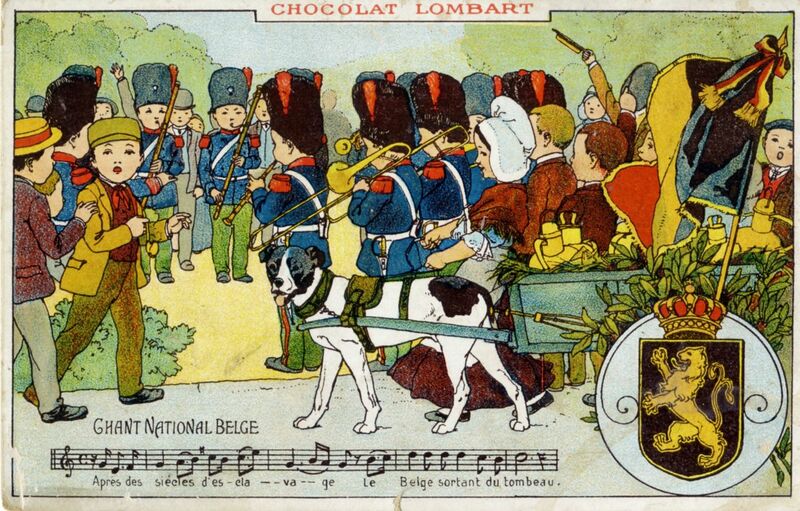 It is therefore unsurprising when, a few years before the war, Belgium and the Netherlands decide to have their machine guns pulled by dogs. The images are surprising today, and even ridiculous, but at the time, the idea was attractive and even modern. 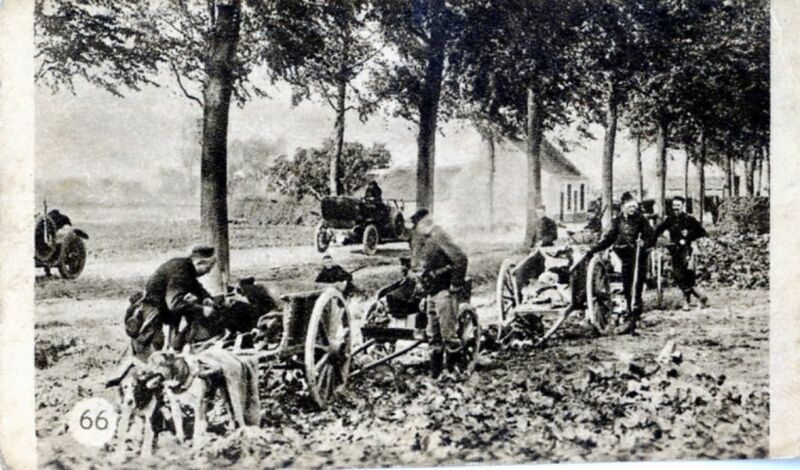 The possibility of having the machine guns pulled across any terrain, more quickly than using mules, for example, and without having to remove the weapon from its mount in order to deploy it more rapidly, and finally the ability to put the dogs and the weapon under cover in simple ditches received support, even abroad. 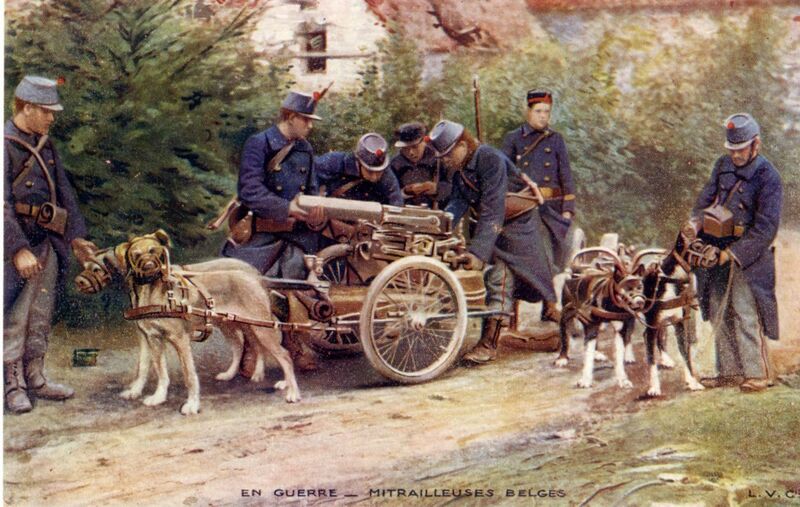 France's Alfred Machin produced "La traction canine dans l’armée belge" for Pathé, with the release in French cinemas in early April 1914. In mid-June, the Paris magazine Le Miroir defends the opinion that this was originally a French idea, and suggests that it should also be adopted in France. 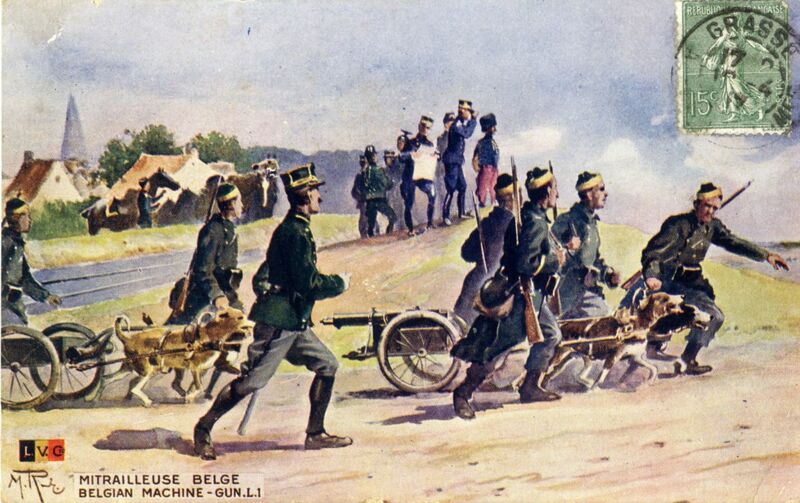 War breaks out less than two months later, and only Belgian draught dogs will have to face the fire, which will once again make them famous on Allied postcards. The realities of the movement war in the heat of the summer of 1914 will put them to a difficult test. Nevertheless, some dogs will continue to be used even after the front stabilises. 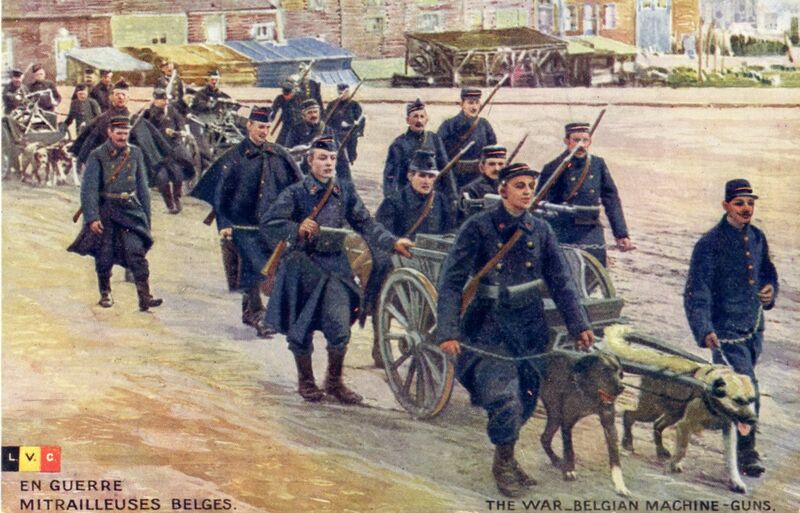 "At war – Belgian machine guns"
"The departure of the Grenadiers – 6 August 1914"
As part of the position war, the army will use dogs for other purposes: guard dogs or rescue dogs for finding the wounded. However, the front will most notably be populated by dogs adopted directly by the soldiers, as pets. The phenomenon began with the movement war in the summer of 1914, as indicated by the young war volunteer Emile Crombé, who is only 18 years old when he joins the Grenadiers. 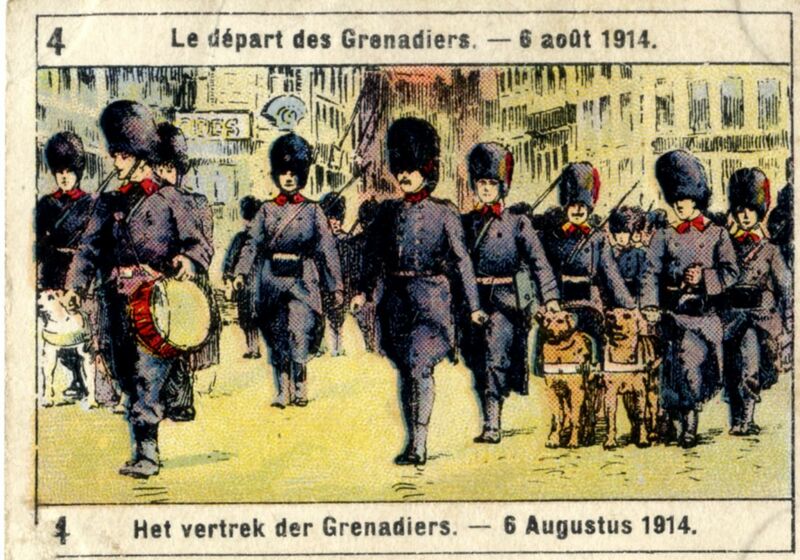 On guard duty in the fortified position of Antwerp, he writes on 17 August: "We've found a guard dog whose chain was caught in the barbed wire, and since its release, it no longer leaves the company". It's just the start of a long companionship. 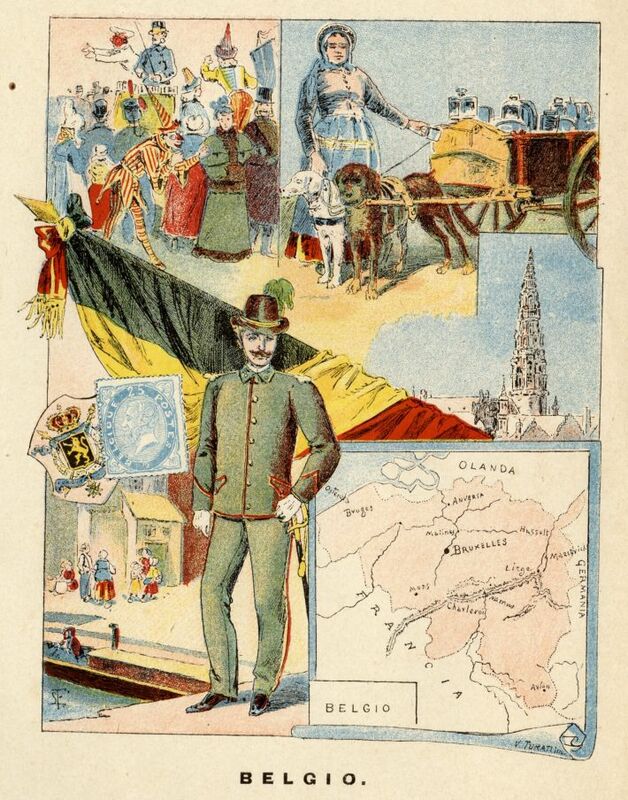 Most Belgian soldiers are cut off their family and friends, and all are far from their cities or villages. Homesickness abounds. 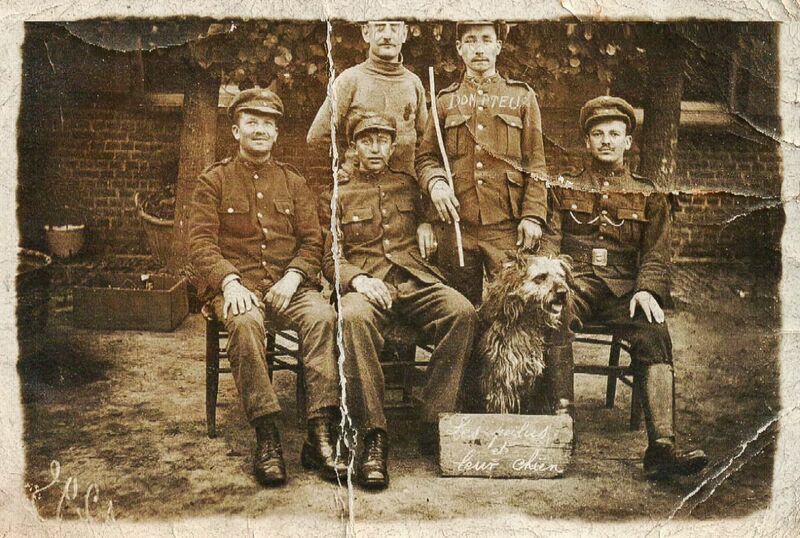 The dog is a companion in misfortune, with a name that often speaks volumes, such as the one mentioned on 14 November 1914 by sub-lieutenant Englebert Decrop, from the 10th regiment of the line: "We're fairly tight in our reduit, especially since our dog "Misery" is still keeping us company." . This companion in misfortune provides many services. It can serve as a guard dog in the trenches. It hunts or drives out rats, which is beneficial in certain sectors. Its status as the unofficial mascot of a unit or small group of soldiers sometimes means that it is considered as a good luck charm. But especially, first and foremost, it fills a need for affection that is difficult to satisfy at the front, in a uniquely masculine setting. In its capacity as a pet, it also offers some vestige of normality, something of a breath of peace time, just like the shelters that have been made charming, with family photos in immediate reach or souvenirs brought from one end of the front to another when relieving the others. 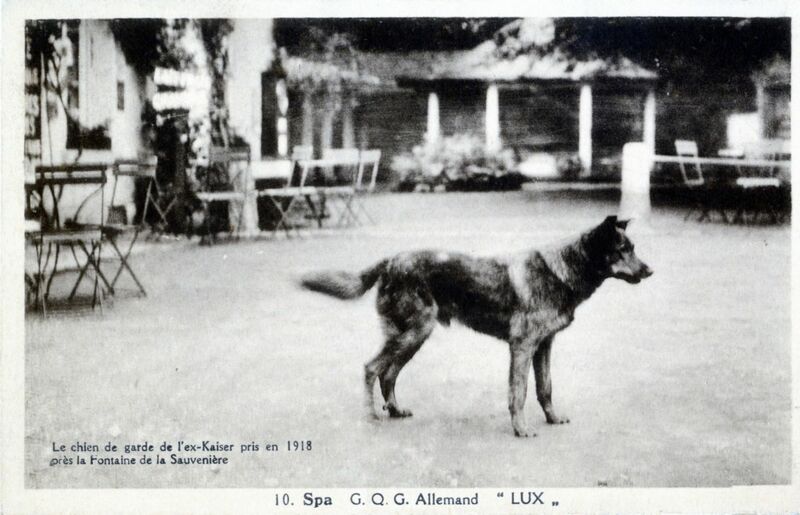 One of many examples given to us by soldier Gustave Groleau, who explains on 6 October 1915 having "spent an excellent evening with generalissimo Joffre's young lady, in this case a female dog named Joffrette" . End of December 1915, another comparable mention: "The night in my new sack went well. Starting at 5 in the morning, I had our little dog with me". Like so many other soldiers, Groleau is very attached to the presence of these faithful companions, mentioned in his diary until the very end of the war. 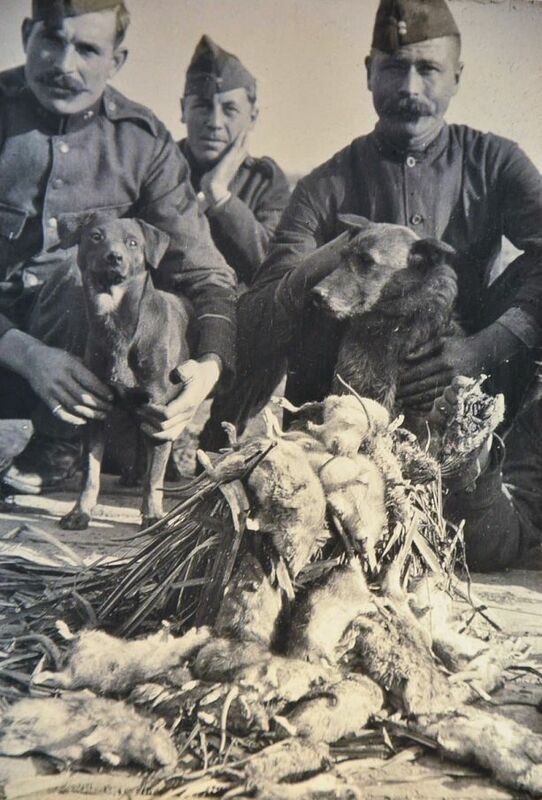 He's therefore very pleased when, in November 1917, the army decides to bring some order to its unofficial canine "personnel": "installed in a prairie, lieutenant Debras [gives] us a little theory; the little troubles, the rub while on duty. […] We can […] keep one dog per squad. It seems rather laughable to worry about something like that". 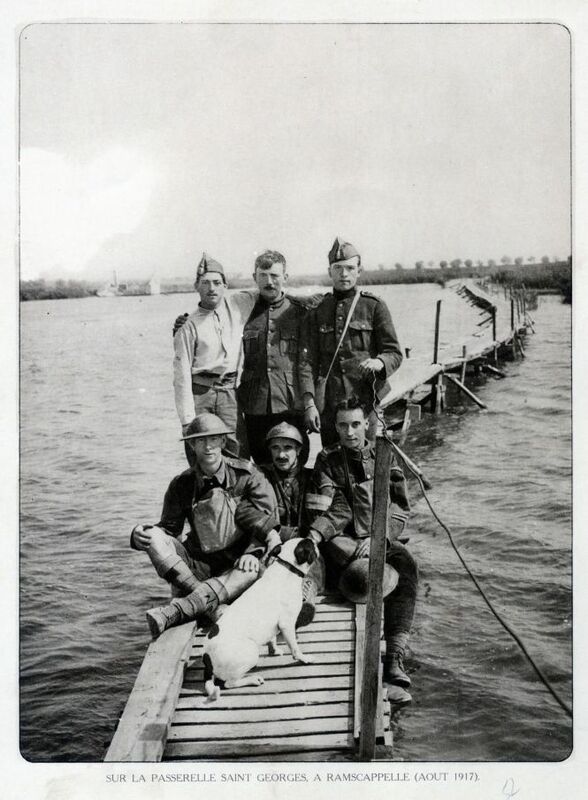 "On the Saint-Georges footbridge in Ramscappelle (August 1917)"
"A street in Nieuwpoort in June 1917"
"The "poilus" and their dog"
From the start of the war, dogs share the same misfortune as Belgian civilians. 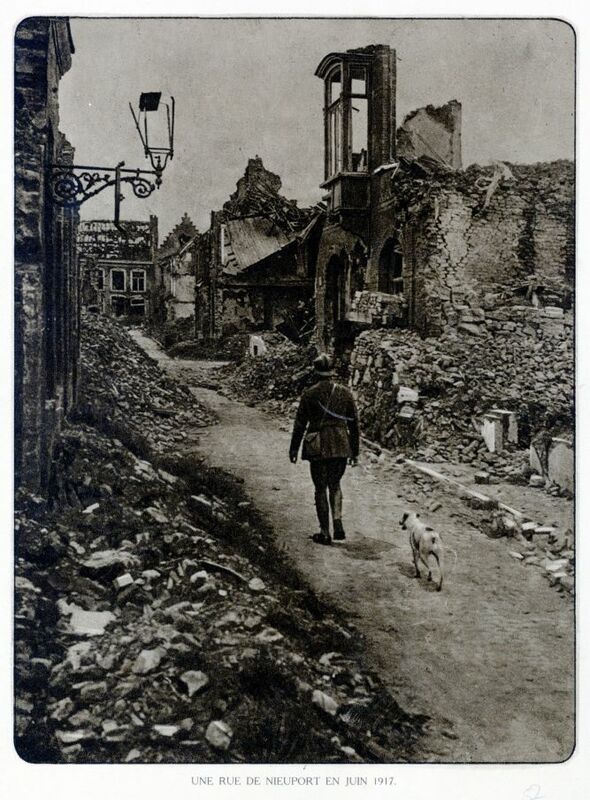 The only victim of the first bombardment of Ostend by a zeppelin, on 25 September 1914, is an unfortunate dog that is perhaps the first canine victim of an aerial attack. The streams of refugees fleeing towards the Netherlands, France or Great Britain are sometimes accompanied by their pets, and the draught dogs of small retailers pull their meagre belongings, just as they pulled items for sale to the market before the war. 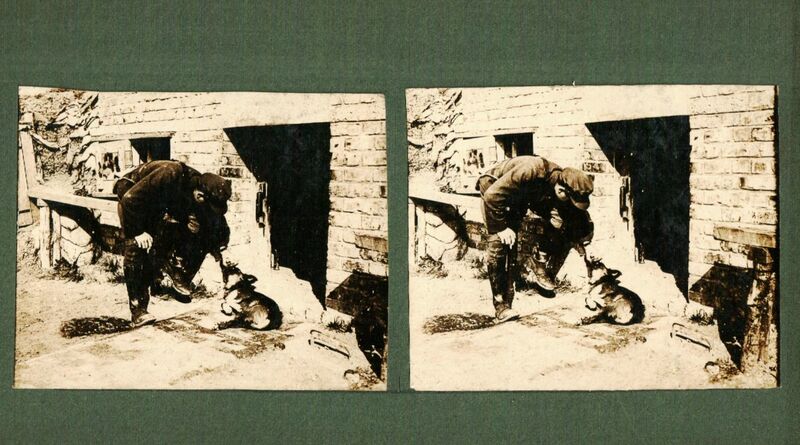 As for the pets whose masters have stayed at home, these pets are sometimes stolen like so many other items stolen by the armies in this summer of 1914. For example, many residents of Mons complain to the communal administration about the disappearance of their dogs when the German troops passed through, such as this inhabitant of the rue de Nimy, from whom the German soldiers stole on 20 August "a hunting dog valued at 250 francs", or this widow, living in the Grand Rue, who in September complains of the theft of her "small griffon dog answering to the name of Duke, [that] always has his tongue hanging out". Small losses in such a dramatic conflict, but ones that truly make the victims realise their extreme vulnerability when faced with the invaders: how do you oppose an armed man? And if he's capable of stealing a dog, why would he just stop there? Once the occupier is installed, pet dogs briefly resume their old lives alongside their masters, sometimes even serving patriotic purposes, such as these dogs dressed up in the national colours, when they aren't unlucky enough to have their fur coloured! But supply difficulties will soon make it very difficult to maintain a dog, except at the cost of great sacrifices. Draught dogs, for their part, become increasingly indispensable as the occupier begins to seize horses, ponies and donkeys. The CNSA (National Relief and Food Committee) uses them for the transportation of the popular soups, flour for bakeries, etc. The occupier, for its part, will soon focus on dogs just like on every other aspect in the lives of the civilians in occupied Belgium. In 1915, the trade in dog-drawn carts is therefore subjected to German orders, that notably indicate the model of medallion that the dog must wear and the information that must be recorded on it, a ban on the master sitting on the cart, etc. However trivial they may seem, the regulations regarding dogs are a perfect illustration of the vexatious nature of the German regulations. Each additional drop in the bucket, day after day, helps the Belgians to understand that they are no longer free. No sector of activity is spared, and the German authority likes to justify its power with a paternalistic posture, aiming to "civilize" the Belgian population: abandoning of traditional liquid manure pits in the countryside (already on the way out before the war) in favour of more hygienic pits, ban on spitting in the street, etc. 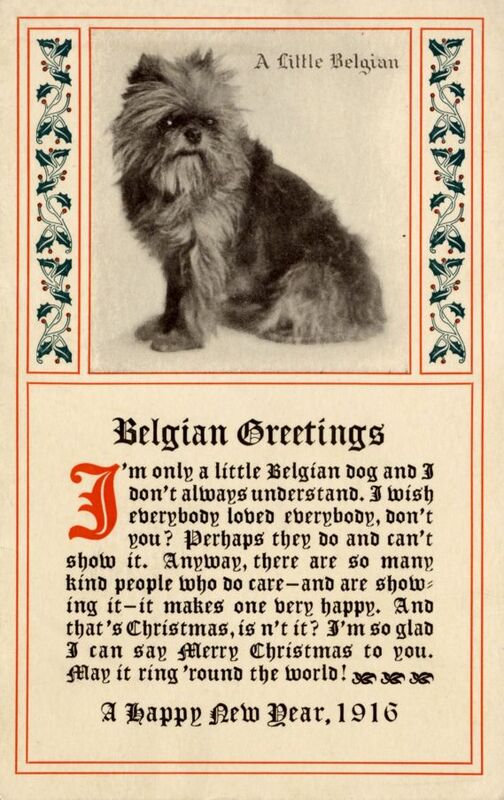 The rules regarding animals, just like the ones regarding dogs or the one, in the autumn of 1915, that prohibits the blinding of songbirds, follow the same logic: forcibly civilizing the "barbarian" Belgians, and simultaneously justifying the German presence in their land. However trivial they may seem, the regulations regarding dogs are a perfect illustration of the vexatious nature of the German regulations. Out of resignation or outrage, citizen sometimes decide to kill their faithful companions rather than surrender them to the Germans. Indeed, one can imagine that many Belgians had already had to resign themselves to this earlier in the conflict, for lack of food. Others abandon them in the hope that they will manage to survive, which does not please everyone. In Bruges, Admiral von Schröder is accompanied by his dog during his promenades on horseback, but also by an orderly… ordered to kill any errant dogs that come too close to his own. In February 1918, in the name of public health and tranquility, this same admiral orders the dogs circulating in the streets to be rounded up and killed if their owners do not claim them within three days. The occupation will therefore result in the disappearance of a good part of Belgium's canine population. The occupation will therefore result in the disappearance of a good part of Belgium's canine population. Certain occupiers, however, are particularly interested in the occupied country's dogs. This is the case of the most famous personality in the world of dog breeders at the time, Captain Max von Stephanitz, founder and chairman of the "Verein für Deutsche Schäferhunde" (Association for German Shepherd dogs). He is the person who "invented" the German Shepherd, by carefully crossing, before and after the 1914 war, several dogs that had been carefully selected for their physique and supposed qualities. Posted to Western Flanders in Belgium, von Stephanitz is thrilled to be able to observe the various races of Belgian sheepdogs, while regretting that his service will not allow him to more extensively devote himself to this observation. 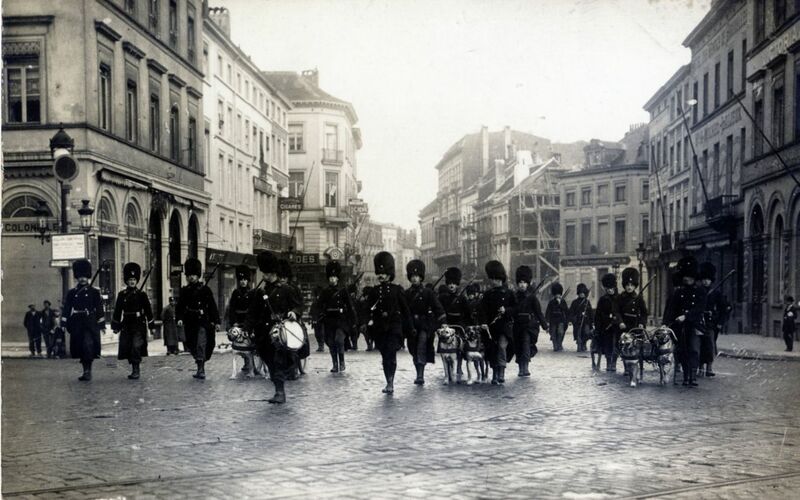 The seizure of Belgian dogs allows the Germans to carry out many surveillance activities required by the occupation: guarding the frontier and railways, police and security tasks. 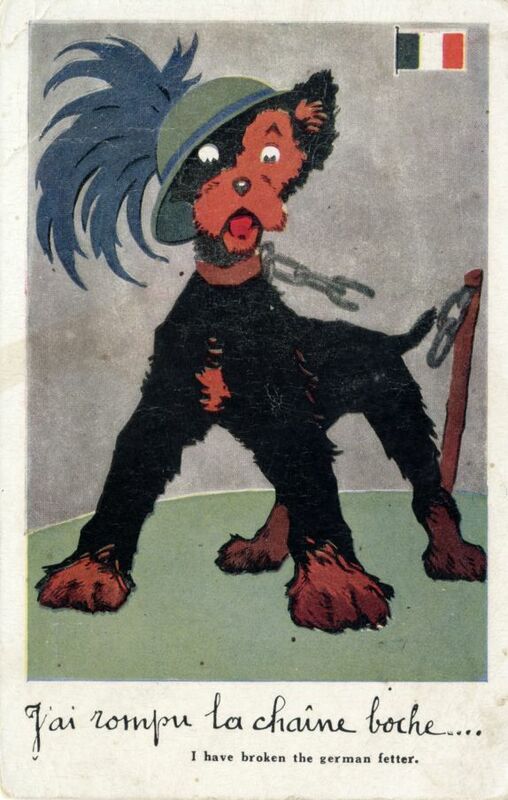 Postcards showing dogs in uniform are therefore far from being just humorous. 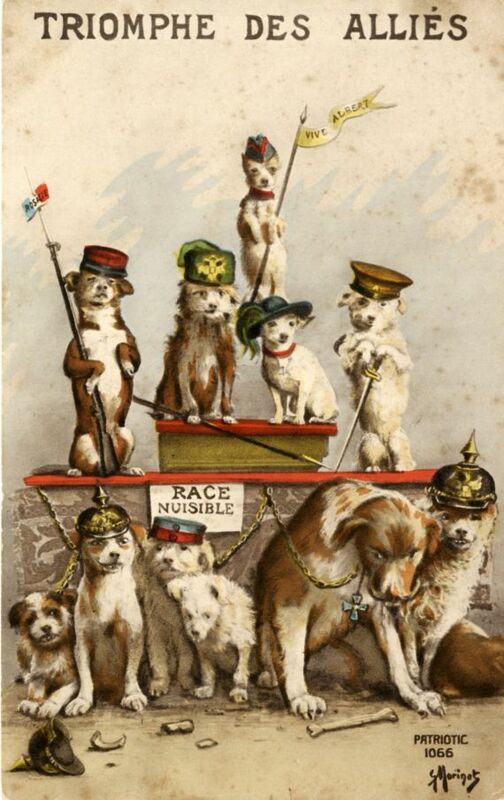 Indeed, one canine race, the one created by von Stephanitz, will cause tension within the world of dog lovers. Before the war, the German shepherd is rare in Belgium, because of the success of Belgian and French sheepdogs. Indeed, the creation of the Belgian sheepdogs club in Brussels in 1891 predates the creation of the Verein für Deutsche Schäferhunde (1899). But the German shepherd experiences growing success just before the conflict, which proves to be problematic for the Allies during the war. How to justify one's interest in a "Hun" dog? One solution is to re-baptize the German Shepherd as the "Alsatian Shepherd Dog", a designation invented in France in 1913 in order to make the race more palatable. "I broke the Hun's chain…"
De Bondt Louis & Hallemans Francis, 1914-1918 in Londerzeel en Noordwest-Brabant. Een authentieke reconstructie van de gebeurtenissen in Noordwest-Brabant tijdens Wereldoorlog I, s.l., De Bondt et Hallemans, 2008.
de Kuyper Eric, Alfred Machin. Cinéaste/film-maker, Brussels, Belgian Royal Film Institute, 1995. Dumoulin Michel, " L’Entrée dans le XXe siècle " in Dumoulin Michel et al., Nouvelle histoire de Belgique, vol. 2, 1905-1950, Brussels, Complexe, 2006, pp. 1-167. Chienne de guerre ! Les animaux dans la Grande Guerre 1914 – 1918 du 3 octobre 2009 au 11 avril 2010, Royal Army and Military History Museum. Press kit and pedagogical files available at the address : http://www.klm-mra.be/cdgho/fr/telecharge.html. Horne John (dir. ), "Dossier: Cultural demobilisation after the First World War" in 14-18 Aujourd’hui, Today, Heute, n°5, 2002, pp. 41-157. Schepens Luc, Brugge bezet 1914-1918 & 1940-1944. Het leven in een stad tijdens twee wereldoorlogen, Tielt, Lannoo, 1985.
von Stephanitz Max, Der deutsche Schäferhund in Wort und Bild, Jena, Ant. Kämpfe, 1921. Adolphe Hambye, "La ville de Mons pendant l’occupation Allemande du 23 Août 1914 au 11 Novembre 1918. Journal de famille". Property of the Hambye family. Archives of the City of Mons. 22/3 : Dommages de guerre : Registres des pillages et dommages de guerre du 22 et 23 août 1914. Royal Army Museum, NNR, dossier 541 (Crombé). "L’histoire du RCBA en Belgique" and "Organisation de la Cynologie", articles available on the site of the German Shepherd club: http://users.skynet.be/sky93069/HISTORIQUE/historique.html.